MickeyTravels is excited about our new initiative – The MickeyTravels Agent Virtual Meet & Greet. We will feature a different MickeyTravels agent on a daily basis. We’re proud to have the best Disney Travel agents in the world as part of our MickeyTravels team and this will allow you to get to know them even better. Today the spotlight shines on Erica Lamb from Louisville, KY! I am from Germantown, Ohio, but have moved around quite a bit. I spent most of my childhood in Waukesha, Wisconsin, middle school and high school years in Dublin, Ohio, and then moved to Florida where I spent the next 17 years. I currently reside in Louisville, Kentucky. I didn’t make my first trip to Disney World until I was 20 years old so I remember most of it quite well. I loved the Haunted Mansion and Space Mountain and, of course, my first glimpse of Cinderella’s Castle while walking down Main Street U.S.A., was amazing! However, the most important memory I have of that first visit was spending it with my entire family, including my grandparents who have since passed away. I will always have the memory of that trip even if they are no longer with us. What makes Disney MAGICAL in your eyes? Disney is magical because once I’m there, the real world fades away and I feel like I have been transported to another place entirely. Favorite Disney destination and why? Walt Disney World! Where else can I go with my family and know that everyone will have a great time? Amazing international restaurants, tons of rides and shows, spectacular shopping, beautiful resorts, and plenty of recreational activities and non-park attractions make it the perfect place to spend a week (or more)! Favorite Disney Character and why? Favorite Disney Attraction and why? I love the Haunted Mansion and have to ride it multiple times each visit, it’s just the right mix of creepy and fun. 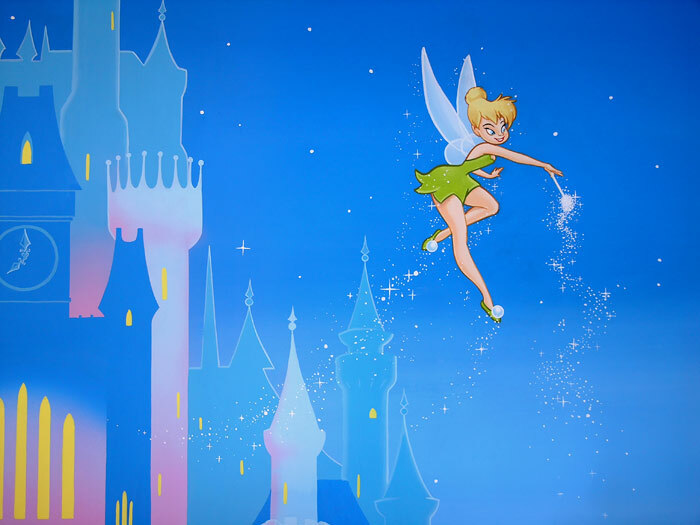 I also have a great fondness for Peter Pan’s Flight – I always feel like a kid again on this ride. Favorite Disney Resort and why? 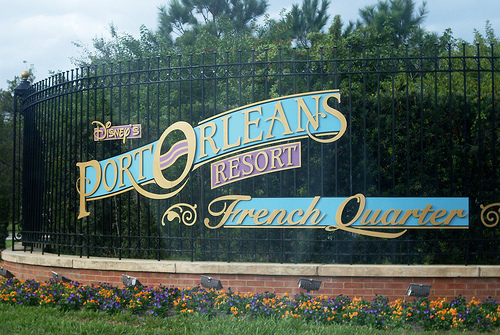 Port Orleans – French Quarter! I love the tranquil setting and strolling the grounds in the evening. The rooms are as beautiful as the grounds! I also like that it’s a very small resort, which makes getting around that much easier. Not to mention the boat ride from the resort to Downtown Disney. Oh, and the beignets! Favorite Disney Restaurant and why? Boma, Boma, Boma! This is a must do each and every trip – non-negotiable. Boma has an amazing assortment of food and will please everyone from the pickiest eater to the most adventurous. Everything is prepared to perfection and I love sampling a little of everything on the buffet. It’s a little hard making room for dessert, but I always manage somehow. I also love taking an after-dinner stroll through the Animal Kingdom Lodge and the grounds to look at the giraffes and zebras. Favorite Disney Quick Service Restaurant and why? Tangerine Café in the Morocco pavilion in Epcot – the vegetarian platter offers a sample of 4 different salads, plus hummus and bread. It’s very filling, but also light enough that I don’t feel tired after lunch. Cosmic Ray’s Starlight Café – I have to have a burger from here each trip just so I can indulge in the toppings bar. Sautéed onions and mushrooms – yum! Also, the back patio offers a spectacular view of the Magic Kingdom. Sunshine Seasons in the Land pavilion at Epcot – It has its own bakery! The food is so fresh and this restaurant has such a great variety of dishes. But really, the bakery keeps me coming back! 3 Disney characters you’d like to have dinner with and why? Stitch, Mary Poppins and Alice. 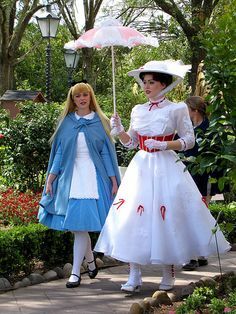 I have always loved Alice in Wonderland and would love to hear about her adventures. Stitch would be great entertainment, and I would love to watch Mary Poppins try to correct his behavior throughout a meal. Favorite Disney snack and why? My absolute favorite snack is the fruit tulip that I used to be able to find in Epcot at the Kringla Og Kafe in the Norway pavilion. This delicious treat has a cookie that is dipped in chocolate, filled with custard and topped with fresh berries. A perfect breakfast or mid-afternoon snack! I also really like green tea ice cream which can be found at a cart outside of the Japan pavilion. Favorite Disney Movie and why? This will sound pretty strange coming from a Disney enthusiast, but I really don’t like Disney movies. Most of them are just too sad for me. 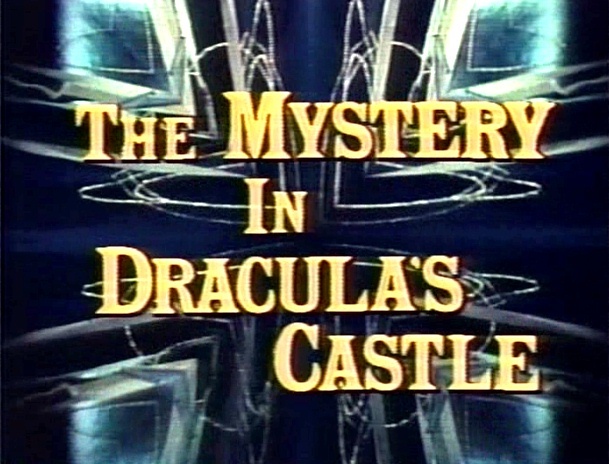 However, way back in 1973, Disney produced a live action film called Mystery in Dracula’s Castle, which starred Johnny Whitaker of Family Affair fame, and I have very fond memories of this film – even though it scared me at the time. This was presented on The Wonderful World of Walt Disney which used to air on Sunday evenings. 3 Favorite Disney Song and why? Grimm Grinning Ghosts – Spooky and fun, I love singing along with this tune. A Pirate’s Life for Me – A swashbuckling tune that makes a great travel tune while driving to Florida. The Wonderful Thing About Tiggers – I love singing this to my dog when she is in a particularly bouncy mood. Disney character you’re most similar to and why? Alice in Wonderland, because I have been cast as Alice in a few different productions. If you could be one Disney mascot for a day who would it be and why? 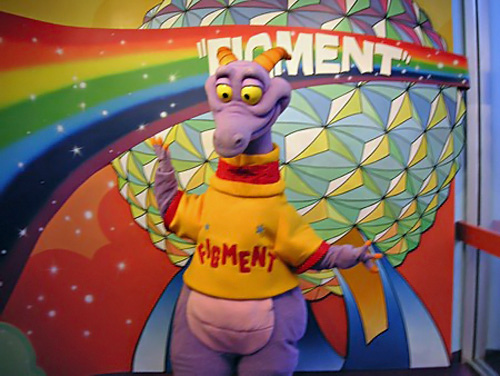 Figment – the ultimate imaginative trickster. What fun! If you could work at one of the Disney theme parks, what job would you want and why? I would love to be a tour guide on The Great Movie Ride. I love all of those movies, and it requires a bit of acting. Best part about being a MickeyTravels Disney Travel Agent? Guiding my clients through all of the different options and knowing that I am helping them choose the best possible resort, entertainment and dining options. I love to get to know my clients and put together options that will make their vacation personal, unique and, of course, magical. MickeyTravels is excited about our new initiative – The MickeyTravels Agent Virtual Meet & Greet. We will feature a different MickeyTravels agent on a daily basis. We’re proud to have the best Disney Travel agents in the world as part of our MickeyTravels team and this will allow you to get to know them even better. Today the spotlight shines on Jeanie Bright from Ohio! First memory of Disney? As a small child camping near WDW. Then we moved to the Orlando area when I was a teenager and I spent many days at Walt Disney World! What makes Disney MAGICAL in your eyes? The Characters!! When I see Mickey I go nuts. I get his autograph and get my picture kissing Mickey! I love the interaction with all the princesses and face characters also. Talking to them about their stories is so much fun. It makes the experience! Favorite Disney destination and why? 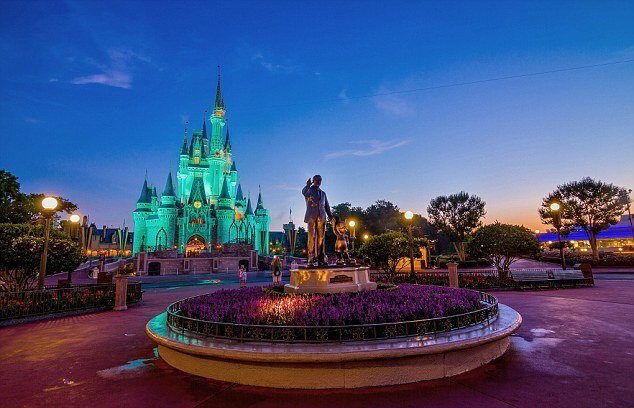 Walt Disney World; there is so much to see and do. We usually spend 10+ days and fill every day with magical memories! We have a goal to try to find something new to do each trip. Favorite Disney Character and why? Mickey Mouse — I just love his personality! Several years ago at Garden Grill I was posing with him for a picture and he turned and wiggled his nose and kissed me and it just stole my heart. He has been my favorite ever since. Favorite Disney Attraction and why? 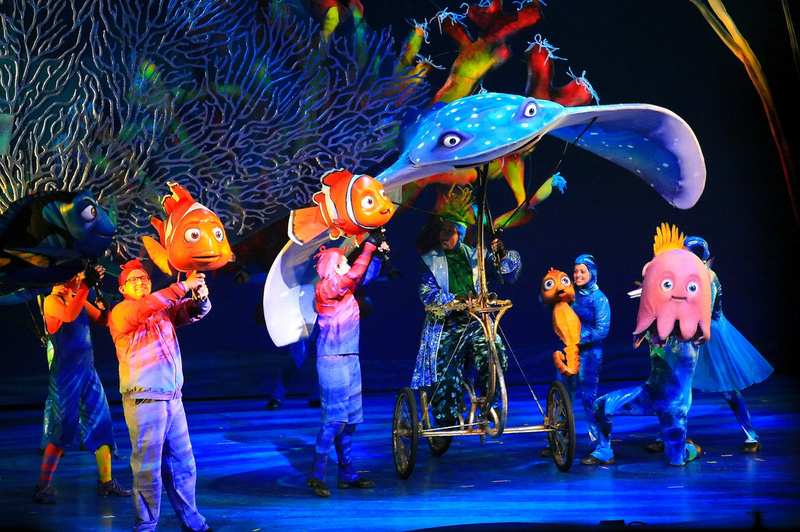 Finding Nemo the Musical. The puppetry by the cast is amazing. The singing and acting is unmatched. It is not only my favorite but a family favorite. This show gives me goosebumps every time I see it! When the cast interacts you can tell there is a true love for one another. Favorite Disney Resort and why? We love Pop Century. It holds a special place in our hearts. We like the value and really like that it has its own bus line. And there’s nothing like seeing the giant character statues throughout the resort. Every stay is always a Hippy Dippy great time! Favorite Disney Restaurant and why? Fairytale Dining at Cinderella’s Royal Table. Dining in Cinderella Castle is just amazing. Walking up the spiral staircase is so exciting and then you enter the royal dining area. You truly feel like a queen and king with this dining experience and you get a free photo! You can also request to sit by the window for an extraordinary view of the carousel! Disney Quick Service Restaurant and why? 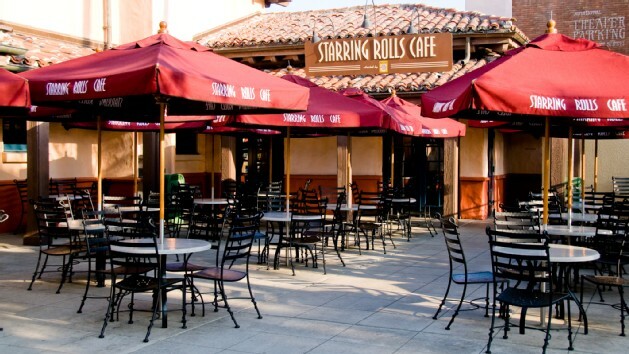 Starring Rolls Cafe. The sandwiches are huge and delicious, and the chocolate peanut butter cupcake is out of this world! 3 Disney characters you’d like to have dinner with and why? Anna, Rapunzel and Mrs. Incredible. Who doesn’t think this would be an amazing conversation with these determined, focused, and optimistic women? Favorite Disney snack and why? LeFou’s Brew at Gaston’s Tavern. It is absolutely delicious and cools you off on a hot day. Favorite Disney Movie and why? Monsters, Inc. The relationship between Sully and Boo is so touching to watch as it blossoms during the movie. 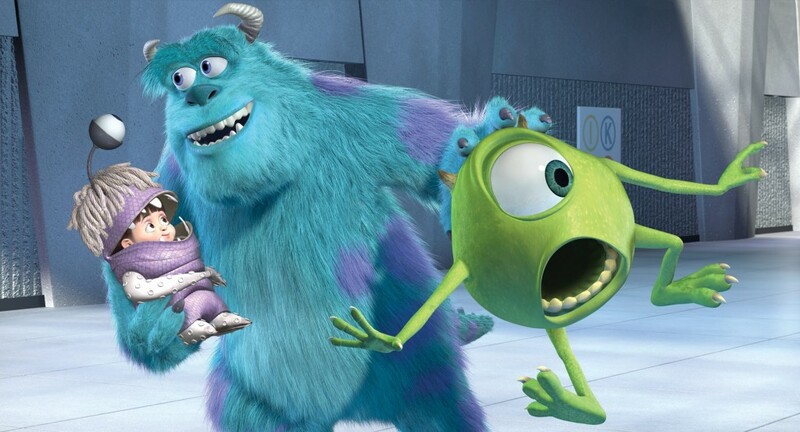 I also love the relationship between Mike and Sully. 3 Favorite Disney Songs and why? When You Wish Upon a Star – You are never too old to wish upon a star. In the Big Blue World – I adore the Finding Nemo the Musical soundtrack. Every time I hear this song in particular I see the stage and all the beautiful puppets and props. Spectromagic Parade Song – We listen to this often and relive the memories of our all time favorite Disney parade. 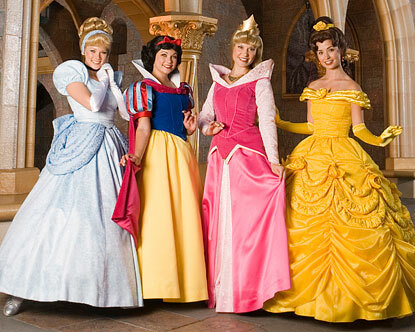 Disney character you’re most similar to and why? Tinkerbell; I have taken multiple personality quizzes and this is who I get, LOL. I am adventurous, loving and loyal. If you could work at one of the Disney theme parks, what job would you want and why? To be a Disney Princess. I would absolutely adore seeing all the little girls dressed up in their princess dresses and watching their eyes light up when they see the princess in “real life” — awwww heartwarming!! Best part about being a MickeyTravels Disney Travel Agent? It is so wonderful helping others plan their Disney vacations with as much passion as I would plan my own. It is fulfilling to hear how magical their experience was and that is how I know my job was well done!! Why should I book my vacation with you? I absolutely LOVE what I do! Whether you are interested in the Disney Cruise or the parks, are traveling with all adults, infants or toddlers to teens I want to customize a vacation to meet your family’s every need! Feel free to reach out to Jamie with any questions or comments. Jeanie can be reached at jeanie@mickeytravels.com or 1-614-805-0275. She can also be found on our website at http://mickeytravels.com/jeanie. MickeyTravels is excited about our new initiative – The MickeyTravels Agent Virtual Meet & Greet. We will feature a different MickeyTravels agent on a daily basis. We’re proud to have the best Disney Travel agents in the world as part of our MickeyTravels team and this will allow you to get to know them even better. Today the spotlight shines on Stacey Ehly from Pennsylvania! First memory of Disney? I remember going on the Pirates of the Caribbean ride when I was 2 years old and feeling like I was going to fall out of the boat when we “dropped” into the “pirates world” part of the ride. Going back as I got older, I realized that this “drop” wasn’t that steep or long after all. It’s great how your enjoyment of Disney evolves as you get older! What makes Disney MAGICAL in your eyes? Disney is the most magical place on earth. When you drive under the “Welcome to Disney World” entrance, the outside world is left behind. You have entered a place of magic and pixie dust. The cast members are happy and so accommodating to every need that you can think of and some that you wouldn’t even think you wanted!! There are extra magical touches at your every turn: whether it is Peter Pan waving to you while you’re on board the Walt Disney World Railroad, receiving an award for being a wonderful grandfather from a cast member, or getting extra fastpasses just because! Disney magic is second to none and why we continue to go back year after year. Favorite Disney destination and why? My favorite Disney destination is Walt Disney World because my family and I enjoy the many different attractions, shows, restaurants and resorts that are offered. Because Disney imaginers are always adding to and/or reinventing existing attractions at Disney World, we have a new and different experience every time we visit. I have also fell in love with the runDisney races offered throughout the year at Disney World and now get to experience my favorite place in a new and exciting way! Favorite Disney Character and why? My favorite Disney character is Belle from Beauty and the Beast. I really like her because not only is she beautiful, but she is smart, likes to read, is kind, and has the ability to look beyond one’s looks to what lies inside. Favorite Disney Attraction and why? 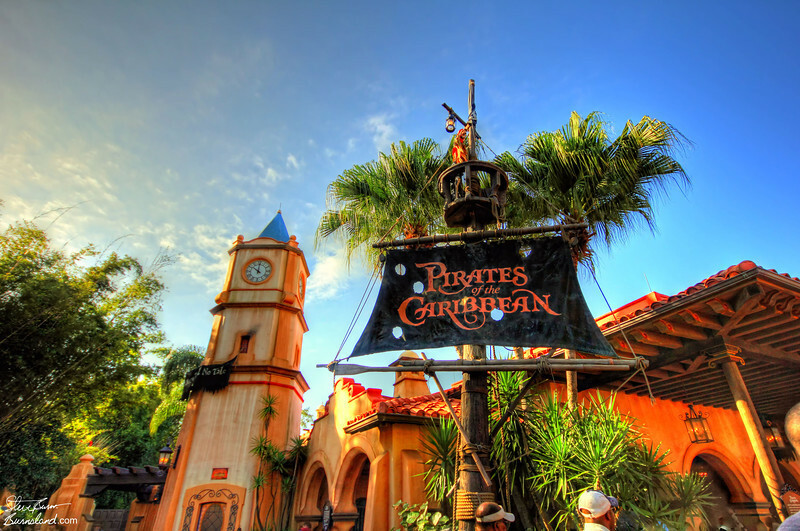 My favorite classic Disney attraction is the Pirates of the Caribbean. As I mentioned before, the ride holds my first memory of Disney World and so it will always remain near and dear to my heart. My favorite newer Disney attraction is the Rock ‘n’ Roller Coaster. I love Aerosmith and the ride is so much fun. It takes you from 0 to 57mph in seconds and then takes you through a series of neon lit twists and turns all to the sounds of Aerosmith’s music. I love it! Favorite Disney Resort and why? My favorite Disney Resort is the Boardwalk Inn and Villas. I love its old fashion charm reminiscent of Atlantic City years ago. The lobby is pretty and quaint and has a fireplace with cozy chairs to sit on. The pool is carnival themed and has a cool clown water slide. Its location, on the boardwalk of course, can’t be beat. There are great restaurants, shops, clubs and entertainment all along the boardwalk, just outside of your room. You have to ability to walk to Epcot’s World Showcase through the International Gateway. You can also walk or take a water launch to Hollywood Studios. I enjoy the ability to run following an interesting route rather than having to circle around the resort several times. At night you can watch the fireworks from Hollywood Studios and Epcot as well. Favorite Disney Restaurant and why? I enjoy so many of Disney World’s fabulous restaurants that it’s hard to pick just one. My family and I always like to visit Chef Mickey’s for breakfast during our stays. 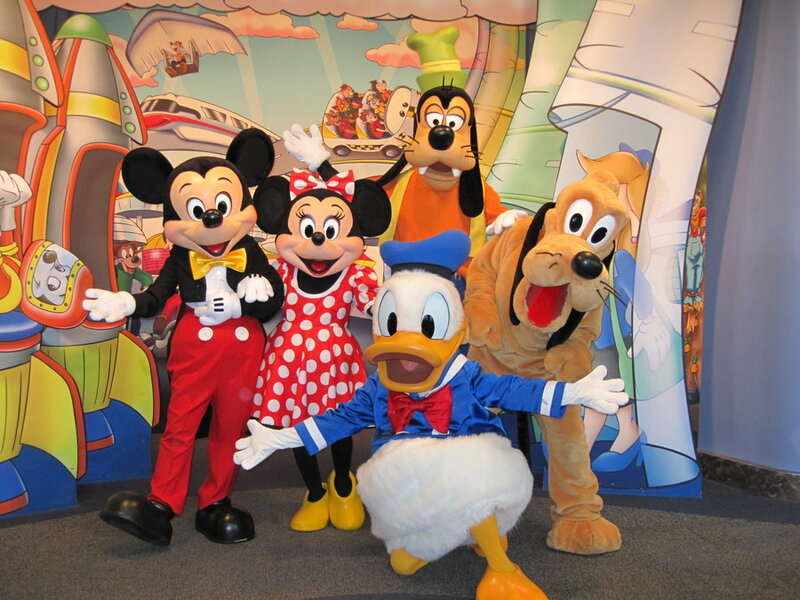 It’s so fun to meet and take pictures with Mickey, Minnie, Goofy, Donald, and Pluto. I love when it’s time to “celebrate” and we dance and twirl our napkins around. The food for breakfast is delicious, from the Mickey waffles to the yummy quiches, there is something for everyone. Favorite Disney Quick Service Restaurant and why? My family and I love to visit Sonny Eclipse at Cosmic Ray’s Starlight Café in the Magic Kingdom. We love Sonny Eclipse’s entertaining songs and antidotes. The restaurant offers three different areas, called bays, to order from. Each bay has different food choices; Bay 1 offers barbeque chicken and ribs, Bay 2 offers hot dogs and burgers, and bay 3 offers double cheese burgers, salads and wraps. Vegetable burgers are also offered and are delicious. 3 Disney characters you’d like to have dinner with and why? I would first love to dine with Captain Jack Sparrow from the Pirates of the Caribbean movies. He is so funny and not bad on the eyes as well. I love how he seems not to have a clue, but is really developing some clever, unique plan to get out of whatever trouble he finds himself in. Second, I would love to dine with the girl behind the mouse, Minne Mouse. I want to find out how she deals with the day to day pressures of being one of Disney’s beloved characters and also how she deals with being in a relationship with Mickey Mouse, who really is THE Disney character supreme. Finally, I would love to dine with Walt Disney himself. It is hard to wrap my mind around how one man could dream of such a wonderful place that makes so many people so happy. Favorite Disney snack and why? My favorite Disney snack isn’t really a snack. I don’t know if you know this, but Disney World doesn’t sell gum anywhere on its property. 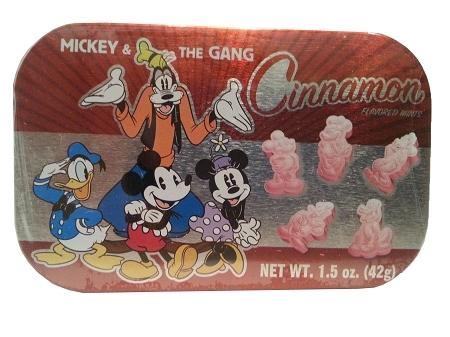 However, Disney does sell Goofy Candy Co. Cinnamon Flavored Mints that are delicious. My family and I look forward to these mints all year. We purchase a ton of them to last us our whole vacation and beyond, but they never do last long enough! Favorite Disney Movie and why? My favorite Disney Movie is Beauty and the Beast. 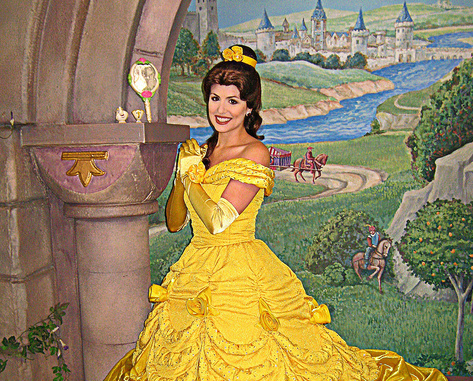 As I mentioned before, Belle is my favorite Disney character because she is smart and kind. I love how the Beast and her relationship develops over time, there is no instant love. My favorite part is the end when the Beast is dying and Belle tells him that she loves him. He turns back into the Prince and they live happily ever after of course! 3 Favorite Disney Song and why? My three favorite Disney songs are Can You Feel the Love Tonight, Beauty and the Beast and Zippity Doo Dah because they were all played at my wedding! Can You Feel the Love Tonight was my processional, Beauty and the Beast was my wedding march and Zippity Doo Dah was my recessional! Disney character you’re most similar to and why? I think I am most like Belle because I enjoy reading immensely, especially romances, I love to learn and I like to think I look beyond someone’s looks to what lies within. If you could be one Disney mascot for a day who would it be and why? 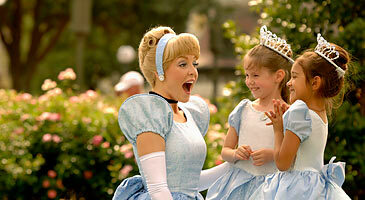 If I could be one Disney mascot for the day, I would be Cinderella. Come on, she is the ultimate princess and has one of the best happy ever afters!! Also, I love her dress, shoes and castle! If you could work at one of the Disney theme parks, what job would you want and why? If I could work at one of the Disney theme parks, I think I would like to work at Magic Kingdom’s Haunted Mansion. I’d like to tell all the “bodies” in the room to move to the “dead center”! Best part about being a MickeyTravels Disney Travel Agent? The best part about being a MickeyTravels Disney Travel Agent is creating the most magical vacation experiences for each and every one of my clients. It gives me such pride and pleasure, (More so then a handful of pixie dust! ), to plan a vacation that puts smiles on all my clients’ faces, young and old, and to be a magical part of a vacation that creates memories that will last forever. Why should I book my vacation with you? You should book your magical vacation with me because I will give you 110% of my attention, experience and expertise in order to create an exceptionally unique and magical experience for your family and you. I will plan your adventure down to the last detail; from resort room or cabin to dining reservations, detailed itineraries, excursions and Fastpass reservations; I will do it all! It is always my pleasure to plan for you a memorable vacation that is of your most magical dreams!